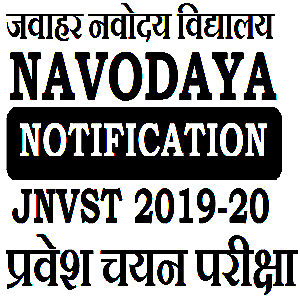 Navodaya Online Application 2019 Registration for JNVST 6th Class Admission Selection test 2019 with 9th Class Vacant Seat Lateral Entry Admission Selection Test Application Registration Online at NVS Official Portal and JNVST Application Forum 2019 Submission Produce for all JNVST 2019-2020 Admissions…. The Jawahar Navodaya Vidyalaya Samiti (An Autonomous Organization Under Ministry of Human Resource Development Dept. of School Education & Literacy, Govt. of India) is invited application through online from eligible 5th class students for JNVST 6th Class Admission Selection Test 2019 and IX Standard Lateral Entry Admission Selection tests to the academic session of 2019-20, and the JNVST Notification 2019 is announced for admission in to 595 Jawahar Navodaya Vidyalaya spread over 34 States and UTs in India. According to the Previous Year admission application registration the JNVST Application Registration 2019 also conducted through online from the Jawahar Navodaya Official website only and there no available from Common Service Centers (CSC) and there is no Offline Application Registration for JNVST 2019-2020. From this year the NVS officials are conducted the JNVST Application Registration 2019 from the NVS Official website with free of Cost, Student who are eligible to apply for Navodaya 5th to 6th Class Admissions and IX Class Vacant Seat Admissions Can register online from JNV Official Website and the Online Application Registration will be completed in Two Phases. The Students who have wish to apply JNVST 2019 the Class 5th at government primary schools Student can get an eligibility certificate from your studying school headmaster before apply. Download the JNVST Eligibility Certificate 2019 to get Authentication by School Headmaster. Full fill the certificate with complete details of student and stick a photograph. After then make scanned copy’s of student photograph and signatures of student and his /her parent/guardian. Full fill the details of State, District, Block, School, Name of the Candidate, Mobile Number, Date of Birth of student. Now Answer the security Core and Submit the phase-1 registration forum. Now the first phase of application registration is completed, the candidate will receive User ID and Password by SMS to their submitted Mobile Phone Number. Now submit personal details student details with uploading of Eligibility Certificate, Scanned copy of Candidate’s Signature, Parent’s Signature, Candidate’s Photograph, Resident Certificate, Cast Certificate and Class V Eligibility Certificate issued by the School Headmaster. Check Once again and Submit in final stage. After Successfully Submitted the JNVST Online Application 2019 you will see a massage on the screen like Successfully Completed, Download the Submitted application soft copy and Save the Reference ID Number and take two copy of Printout and saved the Hard Copy for Future Use of Hall Ticket Download and etc. Note: If all the steps are not completed, then your candidature will not be considered. All the Eligible Students who have wish to apply for Navodaya Vacant Seat Lateral Entry Admission Selection Tests under JNVST Admission Test 2019 they can also get an eligibility forum from your studying upper primary school headmaster and Apply as per same above steps, there is no changes for 6th Class admissions and other Vacant Seats Admission Tests under JNVST 2019-2020. Every JNVST 2019-20 Applicant Must Note, there is no offline application registration and there no Common Service Center Online Application from this year, from this the Navodaya Vidhyala Samithi has conducted the JNVST Admission Selection Test 2019 through Online from their official website only. and there is no possible to register offline and other private education portals, everyone can register from Navodaya Vidhalaya Official Website only. * Note : Don’t Forgot to get receipt of submitted application with Reference ID Number. This is very good news for all students, the NVS Officials are conformed there is no fee for JNVST 2019, every eligible student can register with free of cost, the rural and urban are students has no need to submit their application. The Jawahar Navodaya Vidyalaya Samiti is scheduled the IXth Class Vacant Seats Admission Test on 2nd February and the 6th Class Admission Selection Tests conducted on 6th April 2019 in single phase for all NVS Schools across in the country.